Well, I got in my final 20 miler before the Space Coast Marathon I have coming up. I was a little worried, based on last year, that doing a 20 miler just 2 weeks before the race was a bad idea. But I feel so different this year. My recovery times are so short that they feel non-existant. I can function pretty well after big runs and by the next day I’m fine. I don’t know that I even NEEDED this run, per se, but mentally I did. My last 20 mile run was done in about 3 hours & 25 minutes. Since then I’ve done a 15 & 16 mile run. So I think I was ok for the race but in my mind I wanted to have done a second 20 miler. As I was up visiting some friends in Maryland this past weekend, that meant that the run was going to be in unfamiliar territory. While I like running in new places, I don’t really like doing massive runs like this if I don’t know where I’m going because when you’re going 20 miles, you can get seriously lost. My strategy is usually to find an out and back route that has minimal turns. When you need 10 miles in a straight line though, you’re probably out of luck. My plan for the run wasn’t just to get my miles in. I wanted to do the run as close to race pace as I could in the final 8 miles or so. 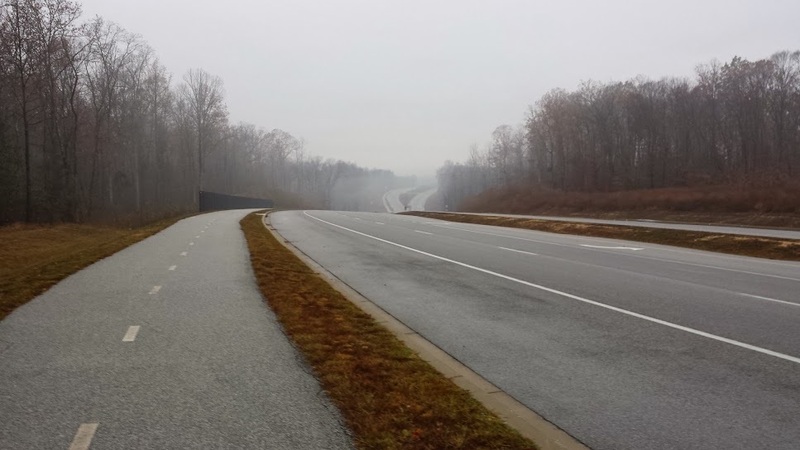 This was a pretty decent place to do this run because the weather was cool but not cold and being in a fairly rural part of Maryland meant I would have a mostly pretty run that was fairly flat with a few gentle rollers. There were a pair of climbs that I did have to go about 80 feet but nothing horrible. Overall the run was tougher terrain than the race which is good for practice. The plan was to do a 5 mile out and back and then another 5 mile out and back on a different road. The first out and back went great. It was quiet, misty, and an easy start to the run. Compared to me not being able to find the start of the Rio Grande last month (no, seriously) the first 10 miles of this run were awesome. Sometimes I’m a little uncomfortable running by myself early in the morning in unfamiliar places. I didn’t feel that way here in part because while it was quiet there was still enough people out and about that made it seem like I wasn’t completely alone. The 2nd half of the run didn’t go quiet as I wanted it to, pace-wise. My goal was to run it at near race pace and that just didn’t happen. It wasn’t bad but I wanted the 8 miles I ran to be about 5 minutes faster than they were. Part of that was due to the 2nd half out and back being a bit shorter than I expected so I spent some time trying to pick where to run while I was running. Once I get into my “find somewhere to go” mode, I definitely slow down. A few times I ran out of sidewalk and that really slowed me down since I was trying not to fall! Overall though it was great! I finished the run in 3 hours 14 minutes and 3 seconds. That’s a little over 11 minutes faster than my first 20 miler in October. Based on the run I did, I’m feeling good about doing the marathon around 4:05 – 4:10 without much issue. My real goal, though, is sub-4 hours. Its something I’ve mentioned only to a few people because its a crazy goal but the last month or so I’ve gained more and more confidence that I can do it. My taper plan has had me running my runs around marathon pace and I’ve been doing 6 – 7.5 mile runs so far on target. I still have to think a little about my race day pacing plan but I have some ideas that I’ll refine as the big day gets closer. I couldn’t have really asked for a better 20 miler to end my race prep with, though. It was fun from start to finish and I finished very strong. If I can replicate the effort on December 1st, my marathon is going to be amazing.